Beneteau 423 "The Teitel Wave"
and ASA 101 courses at the same time. We are now offering two day courses for ASA 103 and ASA 104 as separate courses so it is not necessary to take a day off. Save $80 off of Combo price when you place a deposit for both ASA 101 and the Combo course at the same time. $300 deposit total for both courses reduces the Combo course to $592.48 from $672.48. Private ASA 101 during the week only $586 for one or two people. Enroll in ASA 101 and the Combo Group Course (ASA 103 & 104) at the same time and save $80 off the Combo course. Pick your course date at a later time. Only $592.48 for the Combo course with this discount. Bay Area Sailing School is the leader in sailing instruction, sailing lessons, and sailing workshops for Texas, Kemah, Galveston Bay, Houston, and Clear Lake area. With our sailing club Bay Area Sailing Association, and charter company Sackett’s Sailing Center, we are a full service sailing organization. 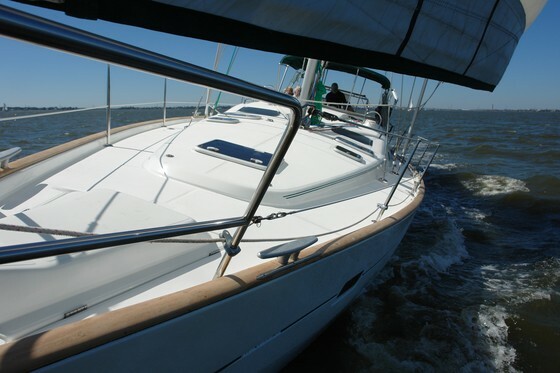 Our home port at Watergate Marina in Kemah, Texas provides sailing courses certified by the American Sailing Association from Basic Keelboat sailing, to Advanced Coastal Cruising. Gain the confidence to crew or skipper boats to 26’ in our Basic Keelboat course, and to 50’ in our combined Basic Coastal Cruising and Bareboat Charter courses. For the sailor that dreams of owning a boat and cruising the Caribbean or sailing the world, Coastal Navigation and Advanced Coastal Cruising are also offered. Click here to learn more about any of these courses. We offer our Basic Keelboat Class every weekend, and our Combo class most weekends.The Coastal Navigation course is offered each quarter. Graduates will enjoy our exclusive free sailing and sailing club membership opportunities. Since 2001, Bay Area Sailing School has won the ASA “School of the Year” award 2 times (2001,2002) and the “Outstanding Instructor of the Year” award 7 times (2001,2004 & 2006) (2 in 2005), (2 in 2017 - Jon Jones and Vernon Lemex)..
We want to teach you how to sail, and keep you sailing. On successful completion of the Basic Keelboat course graduates receive certificates for a free mentor session of about 4 hours with an instructor, and a Free half day charter on a 27 ft.boat. Our mentor sessions are with several other graduates and an instructor aboard. We also offer private Mentor Sessions where you will not share the boat or instructor with other students. The private Mentor Sessions will allow time for at least two hours of sailing. The private Mentor Sessions are $250 and you can bring family or friends with you (up to four). You will still have your free Mentor Session on Saturday morning to use. Free charters are on full size wheel steered boats instead of smaller tiller steered boats used at other schools. You can take up to five of your friends or family with you on your Free charter. Our instructors will spend whatever time it takes to give you the confidence to take your friends sailing - with you at the helm. Note: The free mentor session and charter are not offered at our satellite school. At Bay Area Sailing School, your satisfaction is guaranteed. We want you to have fun, learn how to sail and tell your friends about us. If you're not satisfied - tell us. We'll give you the course over again, with a different instructor, FREE! ASA Certification Fee. $39.00 is included in our course fee, no added fees. Beginning Oct. 1 2007, ASA requires all schools to pay a $39.00 certification fee for first time students. This fee includes a one year membership in ASA .